Skoda aims to boost production by 80,000 vehicles at its plant in Mlada Boleslav, Czech Republic (shown). MLADA BOLESLAV, Czech Republic -- Skoda may need to build another plant in Europe to keep pace with its record-breaking sales. Skoda CEO Bernhard Maier said that is one of long-term options the company is considering, another is shifting output to factories within parent Volkswagen Group's European network. Maier is weighing the alternatives because his two over-stretched factories in the Czech Republic are struggling to meet demand. "Delivery times today are too long, sometimes eight to 10 months for some markets," Maier told journalists at the company's financial results conference this month. Skoda built 858,103 cars last year at its Czech plants, up 12 percent on the year before, as global sales reached a new record of 1.2 million vehicles. Skoda will need even more European capacity once its third SUV, a subcompact-sized model based on the Vision X concept, arrives in 2019. 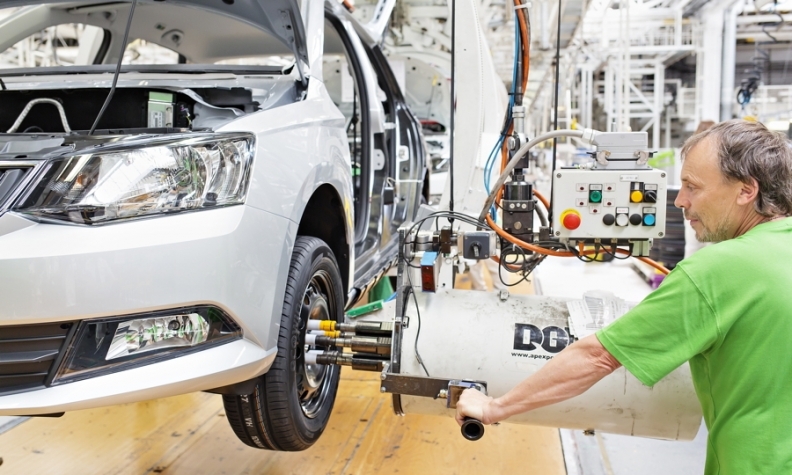 Maier's short-term solution is to boost capacity at Skoda's flagship Mlada Boleslav plant by another 80,000, with the small SUV expected to account for most of the increase. To do this, however, Skoda would need to add a sixth day to the workweek at Mlada Boleslav, a move that the union currently opposes. The automaker has already extended the workweek to six days at its factory in Kvasiny. Both of Skoda's Czech plants run three shifts a day. Skoda could also mirror what other VW Group members have done and utilize spare capacity at one of their sister brand's European plants. For example, Seat is going to make the A1 for Audi at its factory in Martorell, Spain. Maier said that the possibility of moving some output to a sister brand's factory will be discussed when VW Group executives meet next week. "If that is feasible from a business case that could be an alternative," Maier said. "If not, then we have to consider even more." That could ultimately mean building a new plant once all other options have been explored, Maier said. Adding a third factory in the Czech Republic would not easy. Near-zero unemployment and low mobility by the country's workforce make it hard to fill positions already offered. "The number of job seekers is decreasing rapidly, while the number of job vacancies is increasing," Skoda's head of HR, Bohdan Wojnar, said at the conference. Skoda nearly doubled the workforce at its Kvasiny plant between 2015 and 2016 to reach 6,987 employees by the end of last year. It would need a further 3,000 to 3,500 workers at its Mlada Boleslav plant if it added a sixth day of production. Finding the staff will be difficult. "If we want to keep growing the only way is via migration or automation," Maier said. Skoda is increasingly using Ukrainian workers to fill job vacancies, a tactic that has left Skoda open to charges that it is looking for ways to cut its rising wage bill. "Ukrainian employees do wonderful work. It's not a method of salary dumping [using cheaper labor]," Wojnar said. The brand benefits from cheaper wages in the Czech Republic compared with equivalent payroll costs in Germany, but wages went up 10 percent in 2017 and the company has just proposed an 8.2 percent pay raise this year a bid to appease unions and prevent a strike. Said Wojnar: "We pay significantly more [than average industry wages] in the Czech Republic."